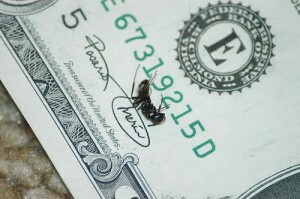 Ants are troublesome pests that can easily find entry into houses and bite unsuspecting people or pets. They can even be dangerous if a person is allergic to a particular ant’s bite. This is why it’s important to call upon Green Pest Solutions to use professional and proper ant control to stop ants from getting into a house. Ants have a keen sense of smell and can detect sugar and sweets with ease. They are very attracted to chocolate, honey, and any other sugar-laden product. Other foods that are greasy or have complex carbohydrates will attract them as well. Even a few crumbs on the floor can have a room crawling with ants in no time. They are very small insects, and they can easily get into a house that has the smallest openings or cracks in it. Here are several useful tips to prevent ants from taking over a house. Ants use scent trails to tell their fellow workers where food and water is. If an ant comes into a house and discovers it to be a good place for getting food or other nourishment, he will leave a scent trail. The house will have an influx of ants in no time because of these trails. Where ever an ant gains entry into the house needs to be sprayed with vinegar. The vinegar will erase the scent trail so that other ants will not know the path to the house. A crucial tip to preventing ants from coming into a house is to give them no reason to want to enter the house. Make sure all sweets and other foods are packaged properly or are sealed in plastic. Snack cakes, bags of sugar, and other such foods are notorious for attracting ants, so seal them up well. Also make sure there isn’t a lot of water on counters or the floor. Moreover, don’t eat food in the bed or on places where crumbs are hard to wipe up. Couches and recliners are prime locations where getting rid of crumbs is difficult. Make sure to clean the floors, tables, and counter tops thoroughly to prevent ants from being attracted there by crumbs, sugar, or other foods. Ants won’t see a reason to come or stay in a house where they cannot find food or water. Ants don’t like things like peppermint, vinegar, and citrus. Making a solution with a bit of peppermint oil in it to wipe down surfaces like counters will let the room smell fresh and invigorating while helping to keep ants out of the house. Citrus-based bathroom cleaners can be used as a deterrent as well. Ants are great at getting into homes by the smallest cracks and holes. This is where caulk can be useful. Try covering up points of entry by dabbing a little caulk into the area to seal it up. Bathrooms are known for having little entryways, so a careful inspection should be done. If caulking isn’t feasible, try using a little bit of baby powder. The baby powder can help stop them from coming in and will disguise the scent trail at the same time so no other ants will come. With a little work, following these tips to prevent ants should help protect homes from the troublesome intruders. 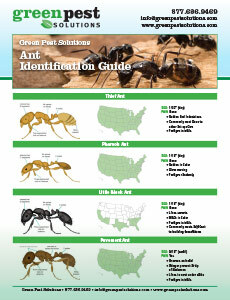 Completely stopping ants is a huge task that can only be done by professionals, and Green Pest Solutions has the tools necessary to give complete protection.